Homeowner’s insurance comes with a special set of challenges, and these are only compounded when you’re seeking an insurance policy for a non-traditional home like a condominium. Smallwood Insurance has the insider knowledge and experience to help you choose the right insurance policy and better protect your home. In short: being insured ensures that you have a hedge against the many things that could go wrong. It’s peace of mind, but it’s also an added layer of protection for your home, plus everything and everyone in it. You are required to have insurance if you pay a mortgage, and some mortgages will even include some degree of insurance. However, this may be the bare minimum of coverage (it’s meant to protect the bank’s investment, not yours). Your condo association may have further requirements; be sure you understand your management or operating agreement in full, and consult with legal and insurance professionals if you’re not sure. There are a few areas to address here. The first is where condo insurance fits into the grand scheme of homeowner’s insurance. It’s technically known as an HO-6 policy, which varies in its particulars from other types of homeowner’s and renter’s insurance, even though it includes elements of each. 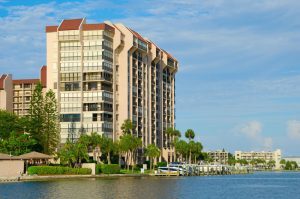 There are two broad types of condo insurance, both of which offer not only differing degrees, but also different kinds, of coverage. Picture a set of nesting dolls. Your condominium complex could be viewed as the largest of these dolls, with individual units being represented by the smaller dolls nested inside. The big doll — the container, if you will — is insured by a master policy held by the property owner or manager, and paid by a portion of your association fees. Its coverage is targeted at common areas, but typically will not cover damages incurred by or within your unit. If the association holds a “Walls-In” policy, coverage will extend to the structure, but not to fixtures (like your flooring, countertops, or cabinetry) or contents. “All-In” coverage will extend to fixtures and major installations on the interior, but still leaves the owners’ contents without coverage. Deductibles are passed on to association members. Those run high to keep premiums low (anywhere from $5,000 to $50,000 or more), and in a new wrinkle, many associations are including provisions in their policies that attempt to pass those deductions directly to individual condo owners in the event that damages can be traced back to an individual unit (for example, after a kitchen fire or an overflowing bathtub). In light of the above, it’s vital that you understand the insurance held by your association, and the rights and responsibilities you have under that policy. Therefore, in addition to the usual considerations, you’ll need to determine whether you want to carry additional protection against the deductions incurred by the master policy. You’ll also need to decide on the type of replacement coverage you’ll take on. Your insurance agent will help you choose one of the three levels of coverage to best fit your needs and circumstances. You may choose an actual cash value policy that pays the value of your condo and your belongings minus depreciation. A replacement cost policy, meantime, covers the cost of rebuilding without a deduction for depreciation. And a guaranteed replacement cost policy will even cover you if costs exceed your policy limit. Because of the unique presence of a master policy, condo owners’ insurance costs are typically lower than those of a typical homeowner. However, given the variables laid out above (and others that may only be uncovered when talking to an experienced insurance agent), it’s not wise to shop on price alone. Smallwood Insurance will help you tailor a policy that maximizes your coverage while also being mindful of your budget. More importantly, we provide support and advocacy should you ever need to file a claim. Here are some other ways in which we help. You may have heard of endorsements or floaters; these are other names for insurance riders, which augment your insurance policy. An agent can help you protect a collection of heirlooms, your art and antiques, or the expensive electronics you own. Real estate is all about location, location, location. Your insurance should be, too. Some areas are more prone to damage due to flooding, fire, hurricanes, or any number of other factors. Your insurance coverage should reflect that — and cover you accordingly. If experience has taught us anything, it’s that few things are more expensive than cheap insurance. If you want to save, do it correctly; each insurer offers discounts for things like bundling condo insurance with auto insurance or a life insurance policy, fire detection, security systems, and a number of other upgrades that make for a safer home. We can help you find and take advantage of those opportunities. Should you be insured? Absolutely. But you should also be insured correctly. Smallwood Insurance has the experience to help condo owners cover all the bases — and protect their investment. Contact us for assistance navigating condo owners’ insurance today.